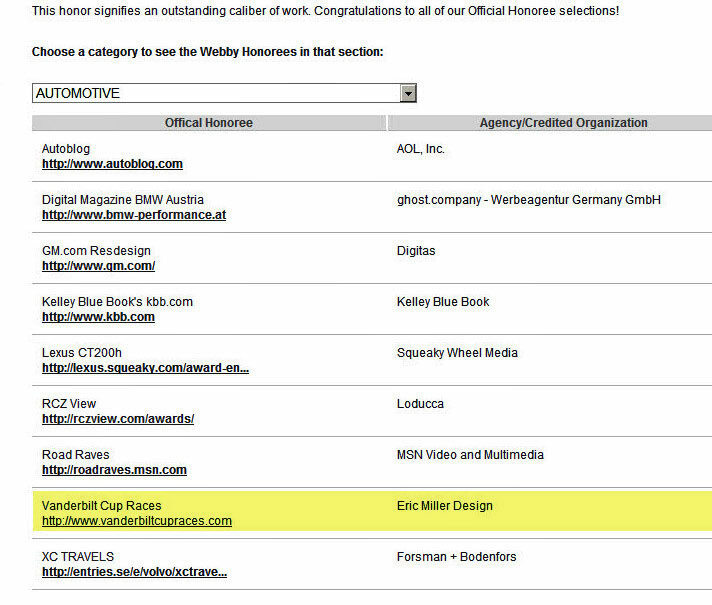 Vanderbilt Cup Races - Blog - VanderbiltCupRaces.com Honored with Two Webby Awards! VanderbiltCupRaces.com Honored with Two Webby Awards! The International Academy of Digital Arts and Sciences announced yesterday that VanderbiltCupRaces.com was chosen as "Official Honorees" in two Webby Award categories; Automotive and Sports. The Webby Awards is the leading international award honoring excellence on the Internet. Established in 1996 during the Web's infancy, The Webbys is presented by The International Academy of Digital Arts and Sciences, which includes an Executive 1,000-member body of leading Web experts, business figures, luminaries, visionaries and creative celebrities, and Associate Members who are former Webby Award Winners and Nominees and other Internet professionals. As a result of the superior quantity and quality of sites entered, the 16th Annual Webby Awards recognized sites and teams that demonstrated a standard of excellence. Of the over 8000 entries submitted to the 16th Annual Webby Awards, fewer than 15% were distinguished as an Official Honoree. This honor signifies an outstanding caliber of work. Congratulations to all of our Official Honoree selections! The 9 Webby Honorees chosen by the Academy include; VanderbiltCupRaces.com, AOL's Autoblog, BMW Austria, GM.com, and Lexus CT200h. 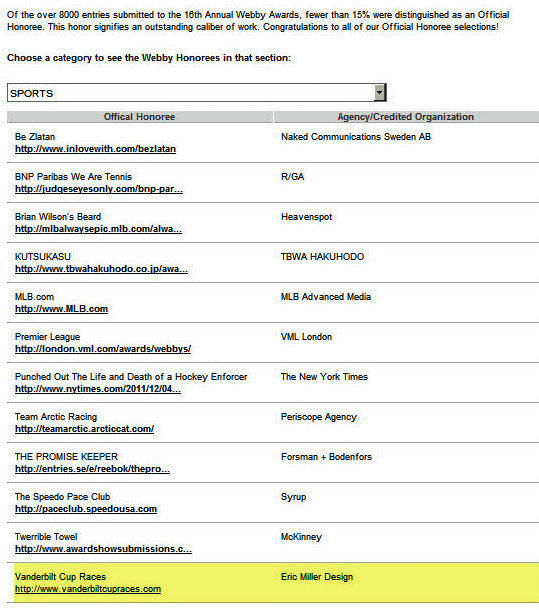 The 12 Webby Honorees chosen by the Academy include; VanderbiltCupRaces.com, MLB.com, the New York Times and Reebok. Congratulations to Dana Kroplick, co-founder and original designer of VanderbiltCupRaces.com, and Eric Miller of Eric Miller Design who created the recent website upgrade! Well deserved, not only for style but also content. Bravo!